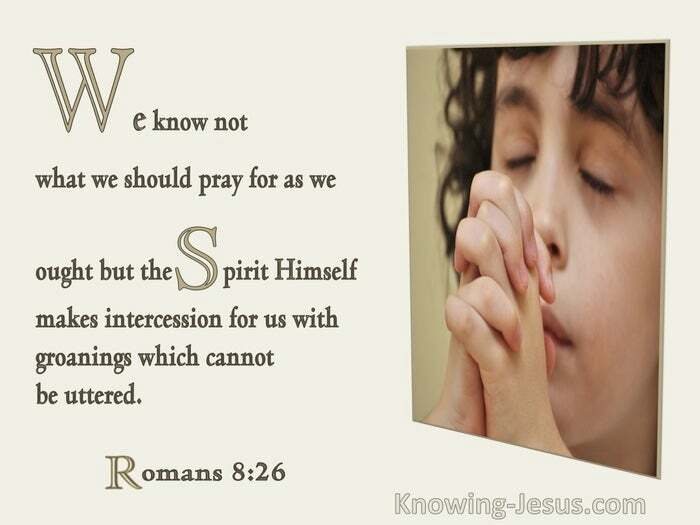 The Spirit of God needs the nature of the believer as a shrine in which to offer His intercessions. "Your body is the temple of the Holy Ghost." When Jesus Christ cleansed the temple, He "would not suffer that any man should carry any vessel through the temple." The Spirit of God will not allow you to use your body for your own convenience. Jesus ruthlessly casts out all them that sold and bought in the temple, and said - "My house shall be called the house of prayer; but ye have made it a den of thieves." Have we recognized that our body is the temple of the Holy Ghost? If so, we must be careful to keep it undefiled for Him. We have to remember that our conscious life, though it is only a tiny bit of our personality, is to be regarded by us as a shrine of the Holy Ghost. He will look at the unconscious part that we know nothing of; but we must see that we guard the conscious part for which we are responsible.